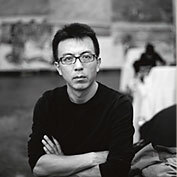 Liu Xiaodong is regarded as one of China’s finest painters. His canvases are known for having rich colors, strong brush strokes, unusual framing (including cut off heads and limbs) and near perfect technique. Many of his portraits are drawn from snapshots of friends or family members, doing ordinary things, like eating, laughing or playing games. An early, defining moment for Liu was when he was given a picture of a Lucien Freud painting. Intrigued by Freud’s ability to capture a person’s inner power, Liu decided to concentrate on figurative painting. In 1993, he and his wife, also a painter, played themselves in a friend’s “neo-realist” film, and Liu was attracted to neo-realism’s focus on common people rather than on metaphysical shapes and ideas. In later years, Liu has put aside his earlier emphasis on meticulously chosen scenery and composition with careful brushwork, and instead he began to try to paint more boldly and spontaneously. Liu Xiaodong, Gallery of Central Institute of Fine Arts, Beijing, China. Liu Xiaodong and His Times, Limn Gallery, San Francisco, California. Liu Xiaodong 1990-2000, Museum of Central Institute of Fine Arts, Beijing, China. Liu Xiaodong, Loft Gallery, Paris, France. Liu Xiaodong, Art Center of Donghai University, Taiwan. Liu Xiaodong, Eslite Gallery, Taiwan. Eighteen Soldiers Between Mainland and Taiwan, Bunker Museum of Contemporary Art, Jinmen, Taiwan, China. Three Gorges: Displaced Population & Three Gorges; Newly Displaced Population, Chinablue Gallery & CAAW, Beijing, China. Childhood Friend Getting Fat, Loft Gallery, Paris, France. Liu Xiaodong: New Work – Domino, Xin Gallery, Beijing, China. 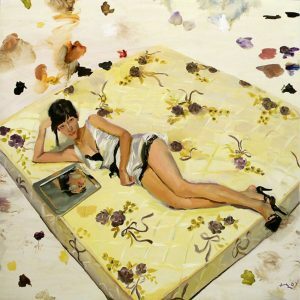 Hot Bed – A Painting Project by Liu Xiaodong, Tang Gallery, Bangkok, Thailand. Liu Xiaodong: Painting from Life, Guangdong Art Museum, Guangzhou, China. The Three Gorges Project – Painting by Liu Xiaodong, Asian Art Museum, San Francisco, California. 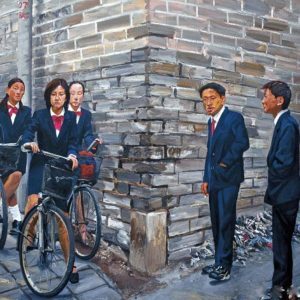 The Richness of Life: The Personal Photographs of Contemporary Chinese Artist Liu Xiaodong 1984-2006, TimeZone8, Beijing, China. Liu Xiaodong, Ray Hughes Gallery, Sydney, Australia. Traces: Liu Xiaodong, Angle Gallery, Beijing, China. Liu Xiaodong – Yan’ Guan Town, Mary Boone Gallery, NYC, NY. Liu Xiaodong: Hometown Boy, Ullens Center for Contemporary Art, Beijing, China. 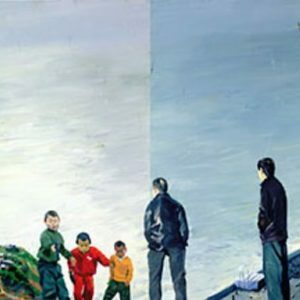 Liu Xiaodong: Hometown Boy, Eslite Gallery, Taipei, Taiwan. Liu Xiaodong: The Process of Painting, Kunsthaus Graz, Graz, Austria. These Days, Very Happy, Massimo De Carlo, Milan, Italy. Liu Xiaodong: Hotan Project, Today Art Museum, Beijing, China. In Between Israel and Palestine, Mary Boone Gallery, NYC, NY. Half Street, Lisson Gallery, London, England. Childhood Friends Getting Fat: Moving Image of Liu Xiaodong 1984-2014, Minsheng Art Museum, Shanghai, China. Liu Xiaodong: Painting as Shooting, Fondazione Giorgio Cini, Venice, Italy. Chinese/Avant Garde, China Art Gallery, Beijing, China. 20th Century China, China Art Gallery, Beijing, China. Art Today in China, California Art Institute, Valencia, California. New Art from China: Post 1989, Marlborough Gallery, London, England. Liu Xiaodong and Yu Hong, OIPCA East Village, NYC, NY. Between East and West: Transformation of Chinese Art in the Late 20th Century, The Discovery Museum, Bridgeport, Connecticut. Contemporary Chinese Oil Painting from Realism to Post Modernism, Galerie Theoremes, Brussels, Belgium. La 47 Biennale di Venezia, Venice, Italy. Representing the People, Laing Museum, Newcastle, England. East Meets East in the West, Limn Gallery, San Francisco, California. Gate of Century: 1979-99, Modern Art Museum of Chengdu, Chengdu, China. The New Face of China, Ray Hughes Gallery, Sydney, Australia. Chinese Art in the 20th Century, National Art Museum of China, Beijing, China. Shanghai Spirit, Shanghai International Biennale, Shanghai, China. China Art Now, Singapore Art Museum, Singapore. A Decade of Experimental Chinese Art – First Guanzhou Triennial, Guangdong Art Museum, Guangzhou, China. On the Edge of the Millennium: New Art from China, Goedhuis Contemporary, London, England. Premier Luers sur l’Orient – l’Aventure de la Peinture Chinoise au 20 Siecle, Palais de la Porte Dorée, Paris, France. First Beijing Biennial Art Exhibition, National Museum of Fine Arts, Beijing, China. Alors, La Chine?, Centre Pompidou, Paris, France. Dreaming of the Dragon’s Nation, Irish Museum of Modern Art, Dublin, Ireland. Mahjong: Chinesische Gegenwartskunst aus der Sammlung Sigg, Kunstmuseum Bern, Bern, Switzerland. The Wall – Reshaping Contemporary Chinese Art, Millennium Art Museum, Beijing, China. The Blossoming of Realism – Oil Painting in Mainland China Since 1978, Taipei Fine Arts Museum, Taiwan, China. 15th Biennale of Sydney, Sydney, Australia. Korea-China Contemporary Art Exhibition – Giants in Illusion, Museum of Fine Art, Seoul, South Korea. Painting of Modern Life, Hayward Gallery, London, England. Made in China, Louisiana Museum for Moderna Kunst, Humlebæk, Denmark. Made in China, Israel Museum, Jerusalem, Israel. The Painting of Modern Life, Hayward Gallery, Southbank Centre, London, England. Case Studies of Artists in Art History and Art Criticism, SZ Art Center, Beijing, China. Half-Life of a Dream: Contemporary Chinese Art from the Logan Collection, San Francisco Museum of Modern Art, San Francisco, California. Waiting on the Wall: Chinese New Realism and Avant-garde in the Eighties and Nineties, Groninger Museum, Groningen, The Netherlands. China 21 Century, Palazzo delle Esposizioni, Rome, Italy. The Three Gorges Dam and Contemporary Chinese Art, Salt Lake Art Center, Salt Lake City, Utah. The Three Gorges Dam and Contemporary Chinese Art, Museum of the Art Institute of Chicago, Chicago, Illinois. Collision, Museum of Central Academy of Fine Arts, Beijing, China. 10th Havana Biennial, Havana, Cuba. Reshaping History – Chinart from 2000 to 2009, China National Convention Center, Beijing, China. Contemporary Art from China and Belgium, National Art Museum of China, Beijing, China. Thirty Years of Chinese Contemporary Art 1979-2009, The Minsheng Art Museum, Shanghai, China. Fresh Ink: Ten Takes on Chinese Tradition, Museum of Fine Arts, Boston, Massachusetts. Encounter: The Royal Academy in Asia, Institute of Contemporary Arts Singapore, Singapore. From Beijing: Works by the Faculty of China Central Academy of Fine Arts, New York Academy of Art, NYC, NY. Host & Guest, Tel Aviv Museum of Art, Tel Aviv, Israel. Gwangju Biennial, Gwangju, South Korea.